My husband Dan McLeod made this!! It's for sale on Etsy. And today it's been listed on numerous blogs, getting so many hits!! I'm so proud of him and his work. He is so creative, funny, talented, and beautiful. 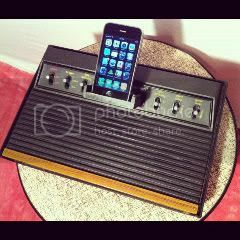 I had an old Atari 2600 that had stopped working and I couldn't just get rid of it, so I converted it to a portable media audio dock. The Atari console had holes in the top where speakers could have gone, but Atari never built it with speakers. I took an old set of computer speakers that had a subwoofer and mounted the raw speakers and amplifier inside the console. It took some "customization" to get the speakers to mount inside, heating and reshaping the plastic. I took a game I had and cut the top so there would be a space for the media device to rest in. The game cartridge was "Basic Programming" On the back there is a power button, volume control, audio input jack, sub out jack and a power cable. The original Atari controls and joystick are for aesthetic purposes only, they don't actually control anything. I shielded the amp to prevent rf interference. I also upgraded the speaker in the subwoofer to an Aura Sound 3" woofer. Will work with any device that has a 3.5 mm analog audio output. The date stamp inside was Nov. 1980. Also check him out on these blogs!! Interesting! We have an old Atari. Wish I could get it working again. The old River Raid game was lots of fun!